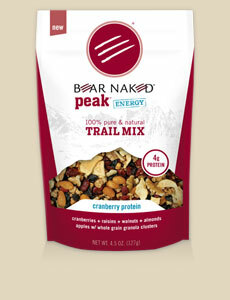 This 100% pure and natural trail mix is loaded with cranberries, sun-ripened raisins, walnuts, almonds and protein granola clusters. A Whole Journey cardinal rule is never combine fruit with grain since this combination can create fermentation and excess acid in the system. We do, however, like that this granola doesn't have any added sugar! While oats are naturally gluten-free, cross-pollination often results in cross-contamination of gluten into the oats, so we would love to see a 'gluten-free' version as well. This granola tastes great. Their products are made from pure and natural ingredients, but not organic ingredients.